October 12, 2018 - Twenty One Pilots have announced the addition of a San Antonio date for their “Bandito Tour” due to overwhelming demand.The band will visit the AT&T Center in San Antonio on June 22. Tickets for the AT&T Center show will go on sale Oct. 19 at 9 a.m. CT at Ticketmaster.com, ATTCenter.com, and 800-745-3000. 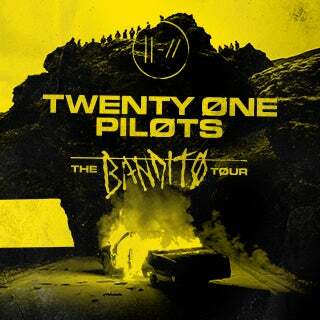 For complete details and ticket availability on Twenty One Pilots’ “Bandito Tour,” visit www.twentyonepilots.com/banditotour. This month Twenty One Pilots celebrated the release of TRENCH with the first leg of “The Bandito Tour,” a massive headline world tour set to get underway Oct. 16 at Nashville’s Bridgestone Arena. The tour will traverse the U.S. through the fall followed by dates in Australia, New Zealand, and Europe. The U.S. leg of the epic trek is now virtually sold-out, with much of the international itinerary fast approaching that same status.